At a certain age skateboarding becomes difficult to justify as a leisure activity, so it makes sense to look for other alternatives (at least as an alibi). We’ve seen skaters walk a parallel path with music, photography, and even woodworking. But how about golf? There are many examples of skateboard pros that find leisure in golfing, with one of the most famous ones being Eric Koston. Following Eric’s first Nike signature shoe, with a golf-tribute in the form of an abstracted golf hole flag on the toe cap, the new version takes it one step further. The source of inspiration for the Nike Eric Koston 2 is driven by a classic golf shoe design, whose details are successfully incorporated on this second Nike powerhouse installment. How the Koston 2 has proven off the green and on the board, can be read in the following review. The Nike SB Koston 2 runs about a half size smaller, especially for people with wider feet. Therefore, try them on at a local skateshop you trust before buying them. One of the eye catching features of the new Koston is the toe cap. It extends from the peak of the toe to the central area of ​​the shoe and proves to be very durable due to the one-piece design. In addition, the model has a reinforced TPU layer bellow the upper layer. This abrasion-resistant polymer layer further increases the durability of the shoe. The padded edge of the material in the transition area to the side panel protects the double seam by slightly cambering out. The welded swoosh, the shaft of suede, as well as the position of the ventilation holes were also designed with maximum durability in mind. This goal seems to have been pursued with every detail of the shoe, even with the laces. The close and far drawn back lacing effectively protects against griptape contact. The lateral part of the sole also offers good durability and is relatively high in relation to the rest of the shoe. 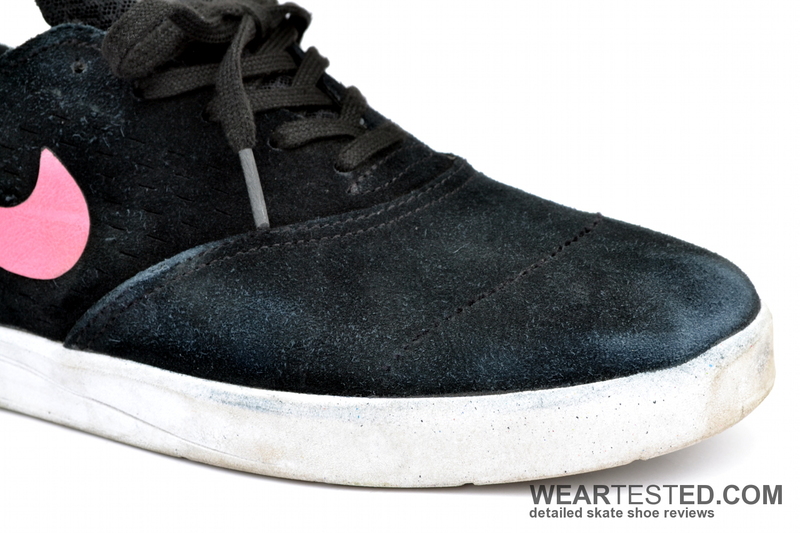 After the 10 hour test period, first wear and tear marks are visible in the kickflip area. The profile of the sole shows no abrasion except for slight wearing spots in the ball of the foot area. The Lunarlon technology has successfully made the transition from the running department to Nike’s skate shoe models. 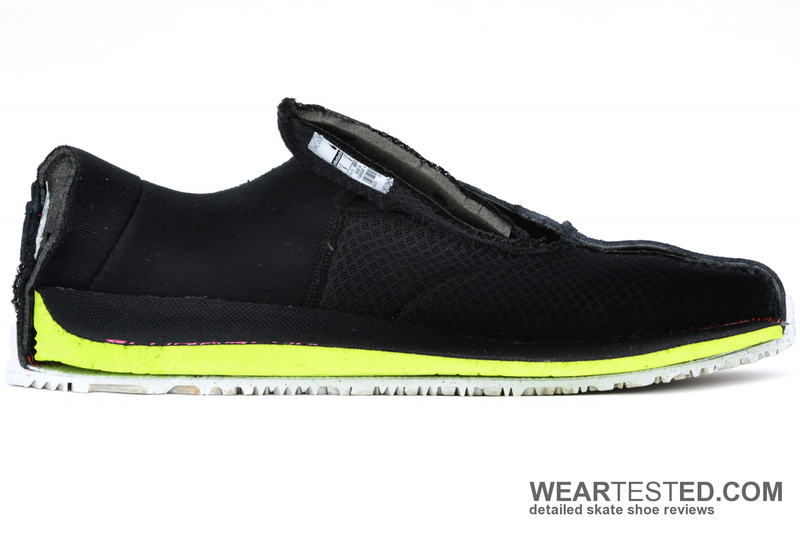 The used insole has a large height difference between the forefoot and heel. This provides great board feel in the relevant front third. Simultaneously, the heel is reliably protected against bruises by the thick foam layer in the posterior part of the shoe. However, the toe area is exposed to greater shocks due to a compromise in favor of board feel. The Koston 2 has a narrow and flat silhouette that fits close to the foot. The long toe cap is divided by stitches and the shoe tapers in the front third very clearly into an arrow-shaped peak. After a short adaptation phase, fliptricks could be very well controlled and the model provides a very good flick overall. 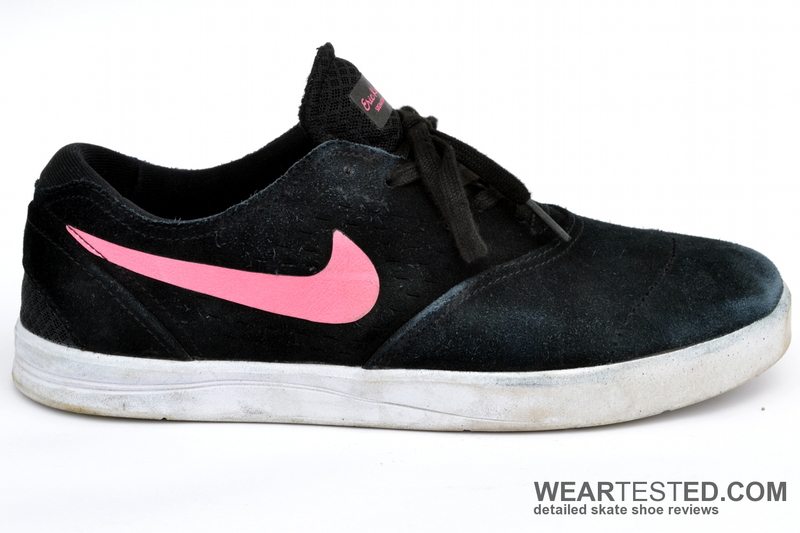 As aforementioned, board feel was obviously one of the main priorities in creating the Koston 2. In particular, the frontal section, which is relevant for board feel, provides minimal cushioning but high flexibility allowing a very direct contact with the board. This improves as wear time increases. 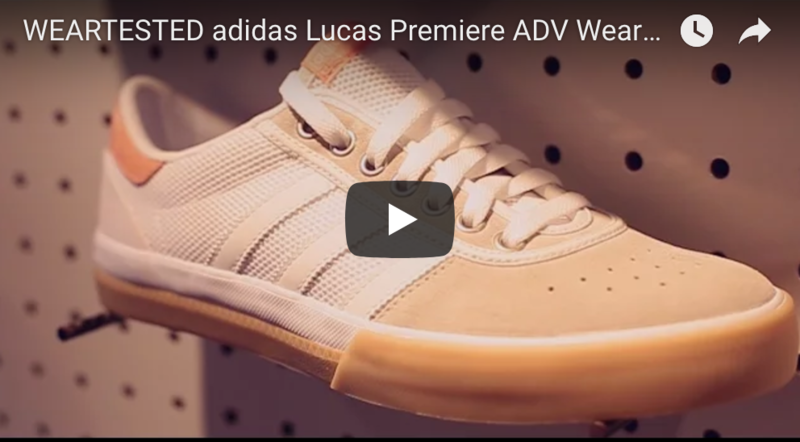 The ability of the sole to optimally adapt to the board concave supports both the board feel and grip of the shoe with the outer edges of the shoe barely noticeable. The slightly modified sole pattern of the Koston 2, like its predecessor, has very good grip. This grip develops fully after one or two sessions and provides an extremely secure and balanced feeling. 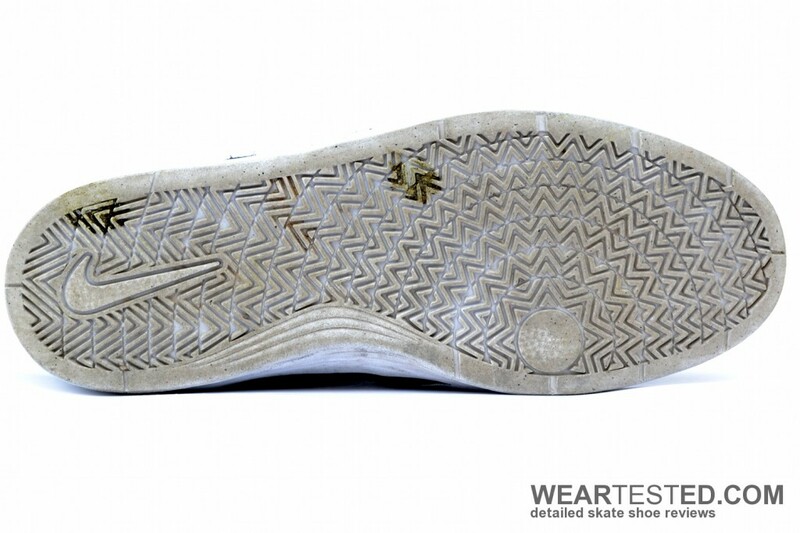 The sole does not have quite the “sticky” grip compared to some vulcanized soles, but seems to be much more durable based on the test duration of 10 hours. The Nike Koston 1 has partly redefined the bar regarding the comfort of a skate shoe. Accordingly, the expectations were high for Eric’s newest model and the Koston 2 meets and exceeds it in many ways. 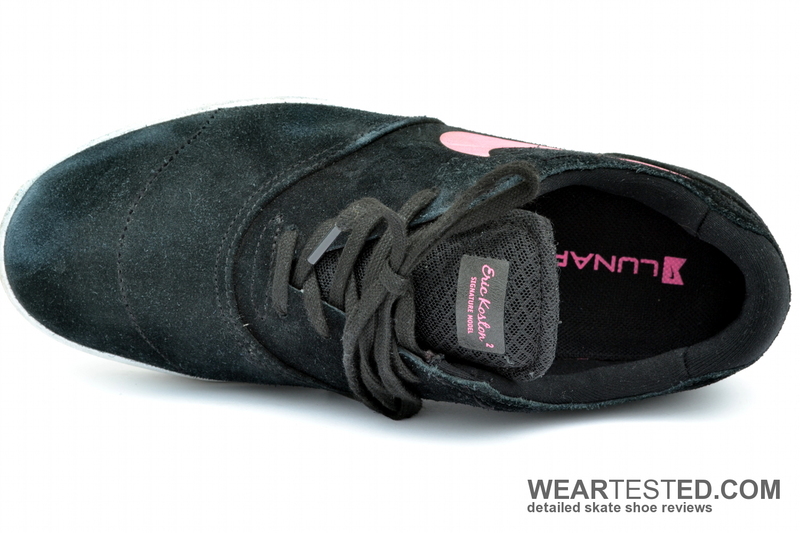 The inner neoprene-like material found in the Eric Koston 1 was kept and used, but the heel was completely re-designed. This new improvement provides a very soft opening for the achilles tendon and a curved reinforcing element which has its roots in Nike’s running models. The result is an arched window near the heel of the shoe topped off with an added mesh insert for ventilation. The shoe fits very close around the heel and slipping out of it is almost impossible.The ventilation overall, however, is contradictory: on one hand the tongue made of coarse mesh material offers prime breathability, but on the other hand the ventilation holes on the side panels are not stamped through the TPU layer, which becomes a problem as the toe cap area is very airtight, and the heat created has no exit point. As for the Koston 2’s stability, it’s above average: despite the low cut and the soft heel, the model still manages to provide a secure and protective feeling with an excellent fit and almost perfect heel hold. Moreover, the solid rubber wedge in the middfoot area of the sole helps to protect against primo landings. The Nike Koston 2 is an innovative cupsole model with good durability and grip, as well as a strong focus on board feel, fit and comfort. A weakness is the lack of ventilation.